Six years ago this month, ICR’s founder Dr. Henry Morris was called home to heaven, marking the end of an extraordinarily fruitful life in service to the Lord. And while the home-going of any believer is an unusual mix of sorrow and joy—for all believers shall be reunited one day (1 Thessalonians 4:16-17)—the passing of our founder was an especially uncertain time for those of us at ICR. How could we continue the work of such a remarkable man whom God used so profoundly in the defense of the faith? 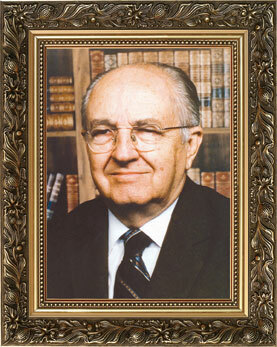 Many solid Christian ministries decline once a founder has retired or passed away. Even with ICR’s long-time transition plan in place, this was certainly on our minds as we looked toward the ministry’s future. Yet the distinctives established by our founder, most notably ICR’s total commitment to the authority of Scripture, have served us well as God has marvelously guided and provided in the years that followed. And by God’s direct blessing, ICR has continued to “enlarge the place of [our] tent” (Isaiah 54:2) through new ministry outlets that have enabled ICR to reach more people today than ever before. ICR’s expanded influence is most easily seen in the stunning outreach of our multifaceted Internet ministries, many of which did not exist when our founder passed into glory. The ICR website, the first of its kind dedicated to biblical scientific creationism, has been enhanced over time and today hosts millions of visitors each year. Our online education ministries—offered through the Creationist Worldview professional certificate course, the School of Biblical Apologetics graduate program, and our new Science Essentials blog—have equipped thousands of Christian leaders, teachers, and laymen to effectively influence their world with the truth of Scripture. And our newest online initiative, the That’s a Fact series of online creation video programs, has been viewed by hundreds of thousands of people in just the last few months. Clearly the Lord has blessed our efforts as the truth of creation and the message of our Creator have spread all over the world. Scientific research continues to be a core emphasis at ICR as we have shifted our focus over time from geology to the exciting fields of biology and genetics—and our research team is yielding some equally exciting preliminary results. If it can be shown that genetic change is limited within the major “kinds” (Genesis 1), the possibility of evolutionary change from a single common ancestor must be completely and utterly false. Much work still remains, but this research would be yet another nail in the coffin for the evolutionary (and atheistic) worldview. Then, too, ICR has completely revamped Acts & Facts into the beautiful magazine you now hold in your hands, while producing several significant new books, K-12 curriculum, CDs and DVDs, and many other new resources over the past six years. Many of these materials are given away as part of our ministry, as God’s provision through His people has allowed us to do. I am certain our founder would be pleased with this practice and the overall ICR ministry today. We invite you to join us, through your prayers and gifts of support, to continue this vibrant work while the Lord tarries. Cite this article: Morris IV, H. 2012. Enlarging the Tent. Acts & Facts. 41 (2): 21.